According to the American Society of Metabolic and Bariatric Surgery sleeve gastrectomy has become the most commonly performed operations in 2012. Sleeve gastrectomy became popular because of the high failure rate of the adjustable gastric banding and the issues with RNY pouch. The Sleeve Gastrectomy was performed many years prior to 2012 as a part of the Duodenal Switch procedure. Stricture is a complication occurring post Sleeve Gastrectomy and Duodenal Switch. Sleeve gastrectomy may appear to be a simple procedure under the surface; however, it is fraught with very unique and challenging complications. These may include, but are not limited to, staple line failure resulting in leak, injury to the spleen, stricture, and even a rare and under diagnosed portal vein thrombosis. Technique is important in avoiding short and long-term complications. 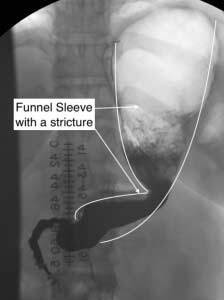 Strictures can be caused by making the sleeve stomach too narrow or by stapling in a fashion where the corkscrew stomach. Some surgeons create a very narrow sleeved stomach in an attempt to maximize weight loss by increasing restriction. This can result in significant GERD in patient with no long-term benefit. Re-sleeving is another incidence were strictures can become an issue. These strictures are debilitating and almost all the time require surgical intervention. Balloon dilation by an endoscopy method is frequently unsuccessful. The patient who has a stricture should seek the attention of an experienced revision surgeon for surgical repair. Strictures are usually a short narrow segment of the stomach. The reason why sleeve gastrectomy strictures do not respond well to balloon dilatation is because of the staples line that is present on one side of the tube of the stomach that cannot be stretched. An increasingly more complicated problem is when the stricture is caused by a spiraling of the staple line. This is quite frequently seen where the stapling of the stomach was started on the greater curvature of the stomach and rotated anteriorly causing a corkscrew effect of the stomach. A long segment stricture of the stomach cannot be corrected by balloon angioplasty and would require surgical intervention. I have been involved with numerous repairs of strictures on sleeve gastrectomies and Duodenal Switch stomach from other institutions. In my opinion, repeated endoscopy and balloon dilatation only complicate further care by compromising the tenuous tissue of a strictured stomach due to scaring and blood supply. As above-stated earlier it is critical that a patient who is experiencing significant reflux, changes in nausea and vomiting, suspected stricture or narrowing, or has a corkscrew stomach to be seen by an experienced surgeon for surgical repair. See the following Blog for health issues that can occur or progress with strictures.